This year's contest theme was "What makes me... me." Akilah Johnson, a sophomore at Eastern Senior High School in Northeast D.C., has received the surprise of a lifetime when she was named the winner in Google's national "Doodle 4 Google" contest. Johnson's doodle, called "My Afrocentric Life," was showcased on Google's homepage Monday. Johnson is the contest's first winner from Washington, since the District was not eligible to participate in the "states-only" contest in the past. Her entry was picked from 100,000 student entries and topped the 53 state and territory champions. Along with being named the "Doodle 4 Google" national winner, Johnson won some other big prizes as well -- including a $30,000 college scholarship and a $50,000 Google for Education grant "towards the establishment and improvement of a computer lab or technology program" in her school. She also won a trip to the Google headquarters in California to meet the Google Doodlers, the opportunity to nominate a teacher to accompany her to Google Headquarters, a Chromebook, an Android tablet, and a T-shirt with her doodle printed on it. For her trip to California, Johnson decided to bring her mother, Tikecia Johnson, and her art teacher, Zalika Perkins, who'd urged her to enter the contest. 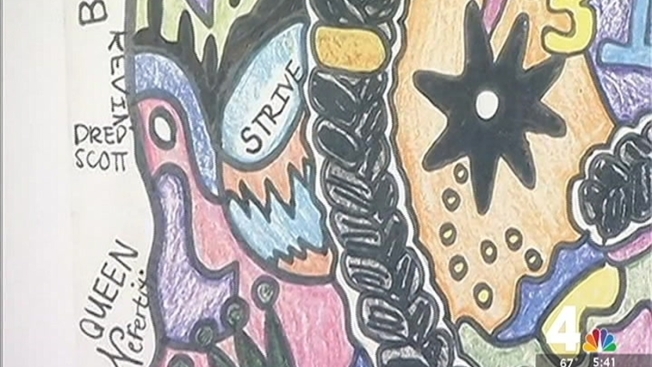 Johnson's attendance in the Roots Public Charter School and the Roots Activity Learning Center in Northwest D.C. was the inspiration for her doodle, which consisted of many black culture symbols and signs that represent the Black Lives Matter movement. She drew the word "Google" as a box braid, one of the many things that represent that. "These schools promote a strong connection to African heritage, and an Afrocentric lifestyle; we regularly celebrated important African-American people, and I learned a lot about my history as an African-American," Johnson wrote in her contest entry. "As I grew older, I realized that the black people that came before us have made us into what we are today. So of course, I had to include them in my doodle on the theme, 'What makes me... me.'" Johnson also paid homage to the District by including the D.C. flag, a Washington sign, and the Washington Monument. "I based this picture off my lifestyle and what has made me into what I am today," Johnson wrote. "Of all the things I chose to include, the six most special to me are the Symbol of Life (the ankh), the African continent, where everything began for me and my ancestors, the Eye of Horus, the word 'power' drawn in black, the woman's fist based on one of my favorite artist's works, and the D.C. flag -- because I'm a Washingtonian at heart and I love my city with everything in me!" Two other local students -- Anjali Pulim, from Clarksville Middle School in Maryland, and Preston Sakata, from Herndon Elementary School in Virginia -- were also finalists in the contest.